Cinygmula reticulata is probably the second most important species of Cinygmula behind Cinygmula ramaleyi, perhaps because the waters where it can be found in good numbers are often more remote. They have been reported as abundant in many high country streams of the Southern Rockies as well as the High Sierra's Eastern slope. An obvious difference in their coloration may be the easiest way to tell them apart. Cinygmula ramaleyi is more somber with a brownish body and dark gray wings and is often confused with the similar sized and colored Ephemerella tibialis, in spite of the difference in tail counts. Cinygmula reticulata on the other hand is a bright cinnamon dorsally with pale creamy legs and pale wings that are often a brilliant canary yellow. This is one of North America's most beautiful mayflies. This taxon's preference for shallow cold water seems to be a limiting factor on distribution. Timing is dependant on elevation and seasonal weather. High country hatches often peak in late July. There is scant reporting on this species in angling literature, so behavior that runs the gamut for Heptagenids is possible. Due to the environs where it is most often found, "selective" feeding is rarely at issue. Substrate: Gravel to small cobble. 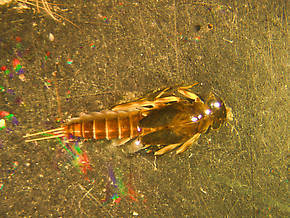 Cinygmula reticulata (Western Ginger Quill) Mayfly Nymph View 1 PicturesI collected several live specimens of nymphs and reared them to the imago (Imago: The sexually mature adult stage of the mayfly is called the imago by scientists and the spinner by anglers.) stage. They were C. reticulata. The interesting thing is they were collected in May and were emerging along with Rhithrogena (March Brown). This seems to be an overlooked hatch since in some rivers it emerges very early, before runoff. 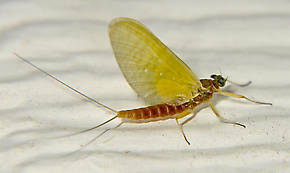 Imago: The sexually mature adult stage of the mayfly is called the imago by scientists and the spinner by anglers.